Java has always given you the ability to create generalized classes, interfaces, and methods by operating through references of type Object. Because Object is the superclass of all other classes, an Object reference can refer to any type object. Thus, in pre-generics code, generalized classes, interfaces, and methods used Object references to operate on various types of objects. The problem was that they could not do so with type safety. Generics added the type safety that was lacking. They also streamlined the process, because it is no longer necessary to explicitly employ casts to translate between Object and the type of data that is actually being operated upon. With generics, all casts are automatic and implicit. Thus, generics expanded your ability to reuse code and let you do so safely and easily. Given that the same functionality found in the following generic GenClass class can be achieved without generics, by simply specifying Object as the data type and employing the proper casts, what is the benefit of making GenClass generic? Notice that NonGenClass replaces all uses of T with Object. 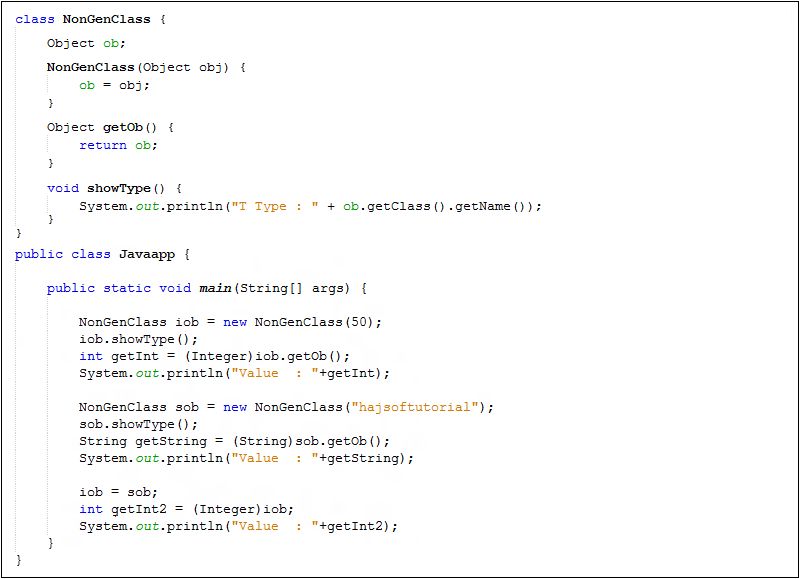 This makes NonGenClass able to store any type of object, as can the generic version. However, it also prevents the Java compiler from having any real knowledge about the type of data actually stored in NonGenClass, which is bad for two reasons. Because the return type of getob( ) is Object, the cast to Integer is necessary to enable that value to be auto-unboxed and stored in getInt. If you remove the cast, the program will not compile. With the generic version, this cast was implicit. In the non-generic version, the cast must be explicit. This is not only an inconvenience, but also a potential source of error. Here, sob is assigned to iob. However, sob refers to an object that contains a string, not an integer. This assignment is syntactically valid because all NonGenClass references are the same, and any NonGenClass reference can refer to any other NonGenClass object. However, the statement is semantically wrong, as the next line shows. Here, the return type of getob( ) is cast to Integer, and then an attempt is made to assign this value to getInt2. The trouble is that iob now refers to an object that stores a String, not an Integer. Unfortunately, without the use of generics, the Java compiler has no way to know this. Instead, a run-time exception occurs when the cast to Integer is attempted. As you know, it is extremely bad to have run-time exceptions occur in your code. Even though both ‘iob’ and ‘sob’ are of type GenClass<T>, they are references to different types because their type parameters differ. This ability to create type-safe code in which type-mismatch errors are caught at compile time is a key advantage of generics. Although using Object references to create “generic” code has always been possible, that code was not type safe, and its misuse could result in run-time exceptions. Generics prevent this from occurring. In essence, through generics, run-time errors are converted into compile-time errors. This is a major advantage.